Jack Berman may not always know what he had for breakfast yesterday, but he knows he shouldn't get behind the wheel. Jack Berman may not always know what he had for breakfast yesterday, but he knows he shouldn’t get behind the wheel. “I could kill someone,” the 84-year-old said. Marsha Berman drives her husband Jack Berman to the dentist as he stopped driving about four years ago. Gordon Chibroski / Staff Photographer. Berman is a Korean War veteran and one-time traffic engineer who helped install Portland’s first traffic lights. 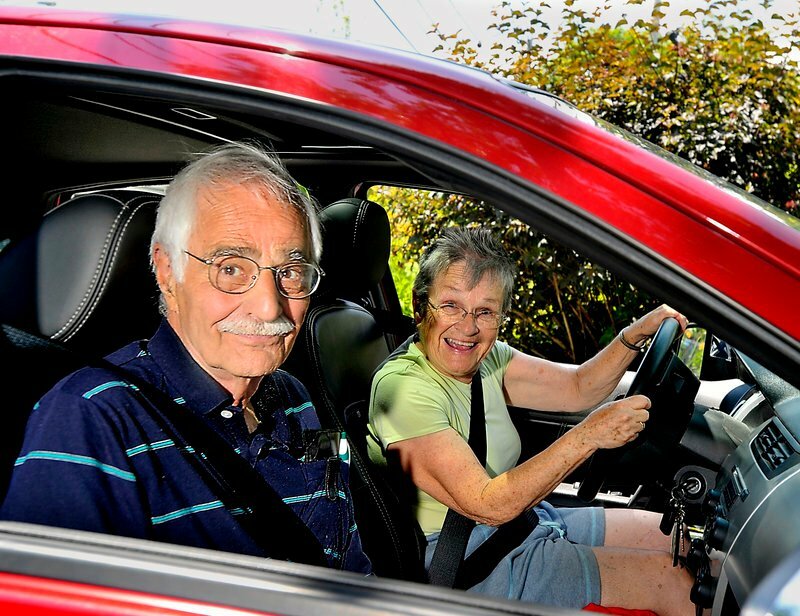 A few years ago, he was diagnosed with Alzheimer’s disease and had to give up driving. It was his doctor’s decision, not his, but Berman recognizes that it was the right thing to do. “I know the danger of not having that reaction time. I just don’t have the same control,” he said. Not everyone accepts losing the ability to drive as easily as Berman did. Older drivers — a group that is growing at an increasing rate — are cause for concern both for public safety officials and adult children who cringe every time Mom or Dad climbs into the Oldsmobile to go to the grocery store. National statistics have shown that drivers in their 70s and older are involved in more fatal crashes per miles driven than almost any other age group, rivaled only by teenage drivers. When they do get into an accident, it tends to be more severe. The fatality rate for those age 65 and older is nearly double the rate for drivers aged 16 to 24, according to the Maine Secretary of State’s Office. * An 88-year-old man drove the wrong way on Interstate 295 before colliding with a state police cruiser. * A 77-year-old man drove through the entrance of a supermarket. * An 83-year-old man pulled an illegal U-turn into the path of a motorcycle, whose driver was killed. Despite what the statistics tell us, getting older drivers to give up their licenses is no small task. It doesn’t just represent a loss of independence; it’s a big step toward acknowledging mortality. Ann O’Sullivan runs the family caregiver support program at the Southern Maine Area Agency on Aging. She often counsels families on when and how to have the conversation with a loved one whose driving days are nearing an end. However, she cautioned against the assumption that all older drivers are bad drivers. “Some have some of the best driving records out there,” she said. Lynwood Schlehuber, 86, lives at the Park Danforth, a senior housing complex in Portland, and still drives regularly. Lately, he’s been driving about three miles every day to visit his wife, who is undergoing post-surgery rehabilitation at the Barron Center. He drives a 1998 Lincoln Town Car, maroon, with veteran’s plates. He served in World War II. “I think I get around pretty well,” he said over a cup of coffee recently. Many resources are available to keep driving skills sharp. Rayette Hudon teaches a course locally for older drivers known as “Keeping the Keys.” It’s sponsored by AAA. Schlehuber has five grown children and more grandchildren than he can remember at the moment. None has encouraged him to give up driving. “Not yet anyway,” he said. What would he do if that happened? “What could I do?” he replied. When people age, their driving skills are affected in several ways. Their reaction time slows down. Their peripheral vision diminishes. Hearing loss sets in. Those changes don’t automatically equate to poor driving, but any one of them can affect driving skills, and they add up. O’Sullivan said the best thing someone can do if worried about an elderly loved one’s driving habits is to take a ride with the driver. When the time comes to intervene, a do-not-drive directive is best coming from a doctor. “Let the doctor be the bad guy,” O’Sullivan said. That’s what happened to Berman. His doctor told him it was time, and that was that. Unfortunately, doctors don’t advise patients to stop driving as often as they should, O’Sullivan said. Instead, family members are forced to initiate that awkward conversation, and “that can really create a lot of conflict,” she said. Those conversations are likely to become more prevalent, especially in Maine, whose population is the oldest in the nation. In 2011, about 15 percent of Maine’s population was over age 65. By 2030, that share is projected to jump to 26 percent, according to U.S. Census projections. Taking away a license or a vehicle doesn’t always alleviate problems, though. Sometimes it creates additional hassles for adult children, who then could be constantly shuttling around their parents as well as their own children. In a mostly rural state such as Maine, a shortage of public transportation options keeps some driving longer than they might if a bus or subway were available. There are alternatives, however, mostly limited to more densely populated areas. Local elder-service agencies offer shuttle services to doctors’ appointments and shopping centers. Public bus services may offer discounts to seniors. Berman has his ride needs met through the Independent Transportation Network, a ride-share service founded in Maine 17 years ago that now serves as a model for similar programs in 20 other states. On a recent weekday, David Chute — “Uncle Dave,” as he’s known — picked up Berman at his home in the Willard Beach neighborhood of South Portland. Chute helped Berman into his SUV and stowed the man’s walker in the back. Berman’s wife, Marcia, waved as they drove away. The two men rode to the Barron Center on Brighton Avenue, where Berman spends three days a week playing cards and doing puzzles with other Alzheimer’s patients. On the way, Berman talked about the Korean War, about his wife and, eventually, about ITN. Berman is one of about 650 members who live within a 15-mile radius of Portland. Nine paid drivers working part-time and nearly 50 volunteers who work less frequently make ITN possible. The premise is simple: Members sign up for $40 per year. When they need a ride, they call to make arrangements. Someone comes to pick them up at their home, takes them to the grocery store, or their doctor’s office, or the hair salon, and then returns them home. Members are charged additionally based on how often they use the service, rather like the Maine Turnpike’s E-ZPass system. Uncle Dave is one of the volunteer drivers. He retired three years ago and expected to spend his days playing golf, but bad feet left him with extra time on his hands. Now he drives. ITN Executive Director Bob Dunfey said he loses about 8 percent of the members every year, most of whom have died. His job is outreach, and he works with many elder-service agencies in the area. “Transition” is a more palatable word than “cease” or “terminate.” O’Sullivan said older drivers often can adapt instead of getting off the road altogether. Maybe they drive only in the daytime. Maybe they avoid rush hour. Maybe they use ITN sometimes and drive other times. Berman, for instance, doesn’t always use ITN. His wife still drives. Sometimes, an ITN ride takes him to the Barron Center and his wife picks him up. Does he miss getting behind the wheel? “Oh, I don’t know,” he said. After he dropped Berman off, Uncle Dave leaned in and said everyone who used to drive misses it when it’s taken away.